Sagittarius perfectly understands the need of Aquarius in an exciting and interesting life, he is happy to provide the child with a continuous chain of adventures. However, Sagittarius needs to be remembered: Aquarius is a sign of air, and therefore does not need as much physical activity as Sagittarius himself. Aquarius should be passionate about engaging in stimulating thinking. Aquarius is also more unruffled than Sagittarius, enthusiastically rushing into the whirlwind of events. Baby has an inner splendor, born of inspiration and intuition, but it hides its abilities, and its alienation allows one to remain calm. As a child, he does not care about the changes taking place around him, he easily adapts to new people and different situations. Unlike Libra, his constant benevolence is not caused by the desire to please others - it only reflects the ability of Aquarius to accept life as it is. It is difficult not to get along with each other, if both are cheerful, intelligent, kind and sociable! This mother understands her child well and is able to play with him or teach him so that it becomes a pleasure for both. Both of them do not tolerate boredom and everyday life. Both love change and new impressions. A mother will always come up with something interesting, whether it’s a joint waste of money or studying life. Boringly they never happen - it’s for sure! True, the mother may not be at a height when you have to seriously think about discipline. All these rules of behavior seem boring to herself… Well, Aquarius with this approach can generally be beaten by hand. It will be necessary for the mother to try to explain to him that in his behavior it is acceptable and what is not. Quarrel these two will be quite often, but in fact they manage even to argue with pleasure! Aquarius loves to defend their rights, and the mother at heart is proud of her independent child. 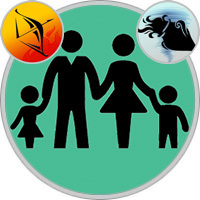 Sagittarius Mom will encourage Aquarius to independent thinking, expressing one’s own opinion and even challenging the authorities. She understands what self-assertion is, and believes in the possibility of spontaneous decision-making. Well, Aquarius is happy that there is someone in the world who accepts him as he is, with all his quirks. Both are willing to take risks and are not going to listen to others, let alone agree with them. Each of them has a head full of ideas, and they spend hours discussing some incredible plans, not particularly caring that not all of them can be implemented. Aquarius likes that his mother considers him quite adult, and he is happy if he can make her a company. When he wants to get something, he uses logic. But if Sagittarius does not perceive this, he is much more upset than seems from the outside. Both of them believe that life is full of the most vivid impressions. They are looking for them, and they always find it. This father is very similar to a boy who adores football or something like that. His child, Aquarius, expects from his father very different - he likes intellectual duels more. They are great thinkers, dreamers and debaters who like to exchange information with anyone who is ready to listen to them. Both are cheerful, intelligent, straightforward, full of energy and fun. Sagittarius can be a good teacher for the curious Aquarius, as he is ready to talk about everything that interests his child. Both of them are somewhat stubborn, especially when they argue, but they are able to forgive each other and easily forget grievances. Well, the joke and the open smile of Sagittarius are always support for Aquarius. Probably, the father will take the child with him on another interesting trip, and he just adores such adventures! Usually Sagittarius has a very busy life, which takes a lot of time from him, and he is glad that his little Aquarius is so independent and does not try to keep him at home. But the father will have to take into account that Aquarius needs much more love and attention than it seems, so one more reassurance will not be superfluous. Sagittarius is not one of those who like to understand subtle emotional problems, and, probably, will shift it to someone else. So he is quite pleased that he is not too sensitive a child. But he always explains to his child what is right, what’s wrong, and logical Aquarius will like it. This father will try to ensure that the child not only approached life creatively, but did not believe that trust is something superfluous. Of course, Sagittarius is unlikely to collect humanitarian aid for refugees, but he will support the idealistic motivations of his child, because he himself is very nice to people. These two can be best friends, because they both believe that you have to live with fiction, and it’s wonderful!